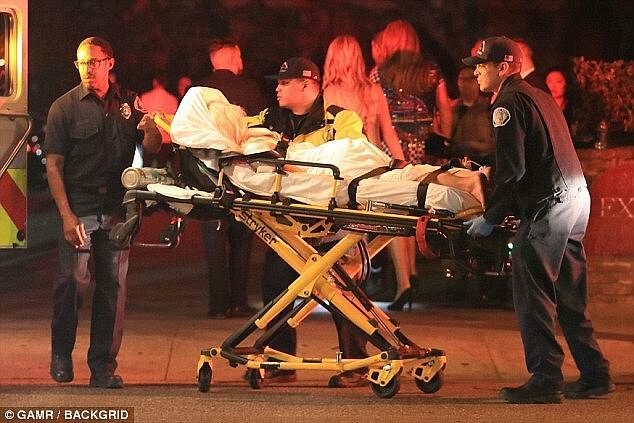 Tammy Hembrow was up and enjoying a gig at the Coachella festival on Sunday night, just hours after footage emerged of her passed out asleep at the event. A video shared to Instagram earlier in the weekend by LA-based musician Mitch appeared to show Tammy, 24, slumped over in a chair and snoring as she rested her head on her right knee. But she was back on her for Ariana Grande’s performance, and pictured among the crowds with a scantily-clad female friend. Her arm slung around a friend, the Instagram star showed a little attitude as she strutted along the grass in a revealing outfit. Wearing a pale orange bikini and a pair of unzipped, orange work-wear pants with chunky hiking boots, she held onto her equally scantily-clad pal. Her makeup intact after the high energy gig, Tammy wore matte pink lipstick, frosted eye-shadow and her long blonde hair in slightly damp waves. The appearance comes after confronting footage surfaced of the Saski designer asleep at the festival over the weekend. Tammy broke her silence over the alarming video a few hours after it went viral, sharing a new image and responding to concerned fans in the comments section. The footage, which Mitch later deleted, was viewed thousands of times in Australia on Monday morning after it was reposted to the Brown Cardigan Instagram account. The original post was captioned: ‘Coachella was too lit for tamtam’. Hours after the Coachella footage went viral, Tammy shared a photo of herself at the festival to Instagram, seemingly having recovered from her big night out. She was dressed in the revealing orange same outfit she later wore to the Ariana Grande show. In response to this comment, Tammy wrote: ‘I snore so bad lol’. She later apologised for the incident in a tearful YouTube video.